The consortium of Menkès Shooner Dagenais Letourneux Architects / Provencher Roy Architects have signed an important retrofit project of the Casino de Montréal. 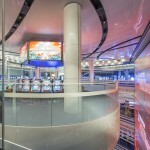 This project, which spread over four years, responded to the challenge of simplifying the building’s indoor and outdoor circulations, improving the quality of the gambling, recreational and dining areas as well as providing a thematic unity to the different designs. 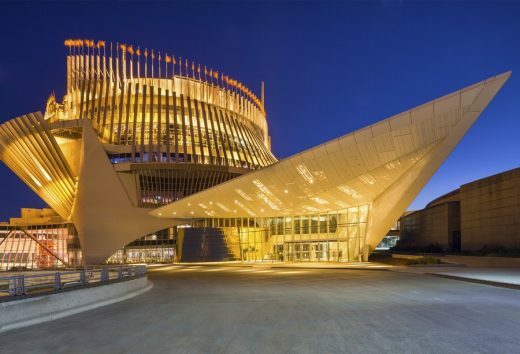 “We are proud we succeeded in finding the former Expo 67 pavilion’s character, which now makes the Casino de Montréal a gambling establishment that is unique in the world and renowned for its original character”, says Claude Provencher, Founding Partner of Provencher Roy Architectes. Exceptional fact, the Casino’s redesign will have led to the development of a real creative laboratory, with its own research and development budget. “The Casino was an unparalleled site of experimentation. With the help of local artisans, all the work on the space and material will have enabled us to assert the building’s unique and singular character even more,” confirms Jean-Pierre LeTourneux, Founding partner at Menkès Shooner Dagenais LeTourneux Architectes. The current project will complete the work that began in 1993, during the first stage of renovations that breathed new life in the former France pavilion of the 1967 World Exposition. 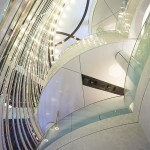 The design and renovations were completed in a record time of 10 months. Following its immediate success, the following and limited enlargements were undertaken for the first time in 1994, and a second time in 1996, in the building that housed the former Quebec Pavilion. The new phase of renovations enabled a comprehensive review of the circulations and resolved some functional problems at the same time. 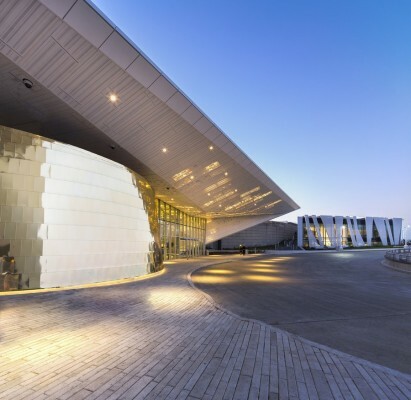 The architects simplified the space by focusing it around a circular hub across four levels, where the recreational areas come together (bars and lounges). 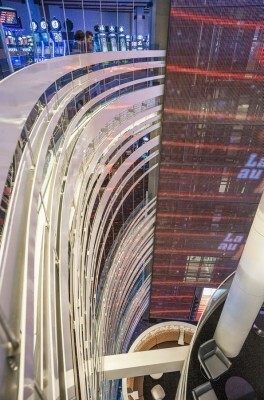 The gambling areas are located around the vertical column lit by a big mesh of aluminium slats, with panoramic elevators on the south side and a staircase on the north side. The 5th floor encompasses the restaurant service, with two fast food counters (Asian and Western), a buffet and an à la carte restaurant. To preserve the unity of the gambling area, the former administrative offices have been relocated outside the building. The multiple previous accesses have given way to a single majestic entrance, covering the reception, cloakroom and security areas. 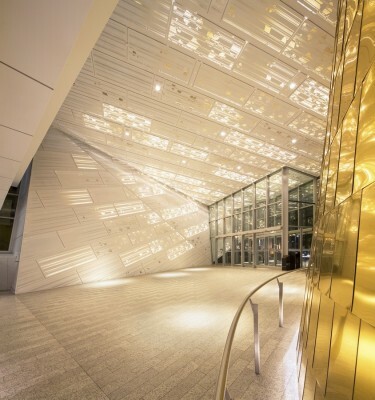 Outside, the designers streamlined automobile and pedestrian traffic that now converge to a single entry point. Setting up a strong identity was critical from the early stages of the project. 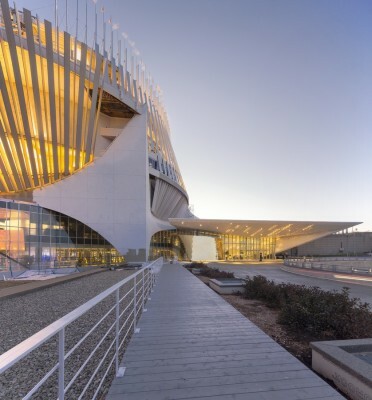 For Yves Dagenais, Founding Partner of Menkès Shooner Dagenais LeTourneux Architectes, it was a question of finding, in collaboration with the marketing team, the Casino’s true strength of the tone, with regard not only to its position in the city but with its clientele as well. The current renovation project provides the interior space with its own personality, defined by a gaming, light and Montreal spirit theme. 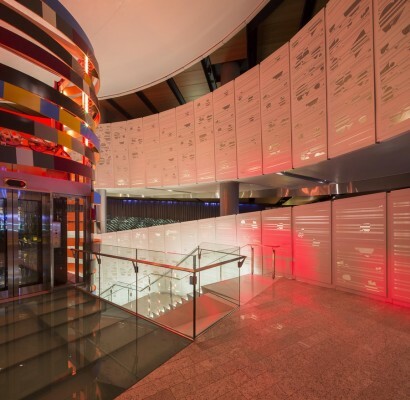 Each of the four gambling floors is identified by a playing card colour with the designs discreetly displayed in the perforated aluminium panels on the walls. By the same token, huge mannequins portray the effigy of a card figure (Queen of Hearts, the Joker…) that greets the visitors at the entrance of every recreational zone. Oversized tokens are hung or drawn on the ground to enhance the symbol of the game. 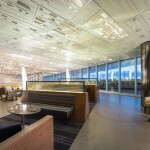 Light is omnipresent and is projected by the many lights as well as filtered through the backlit walls. It benefits from the permeability of the space, like the immense open palisade made of laser chiselled chrome pipes that separates the gambling areas from the recreational areas. In turn, Montreal’s spirit is conveyed on a monumental media screen, designed by the architects and programmed by the firm Moment Factory. It spans over five floors in the middle of the building and is transformed into a permanent multimedia presentation zone. The Casino thus becomes a space to share Montreal’s culture and creativity. A rare occurrence for this type of project, the Casino’s redevelopment was transformed into a true experimental laboratory. 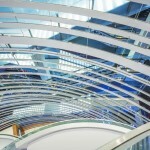 A special research and development budget was planned to develop and test new materials, structures and lightings. This creativity was led to change the traditional perception of the space’s functionality. The walls became signs, ambient lighting and visual identity support. 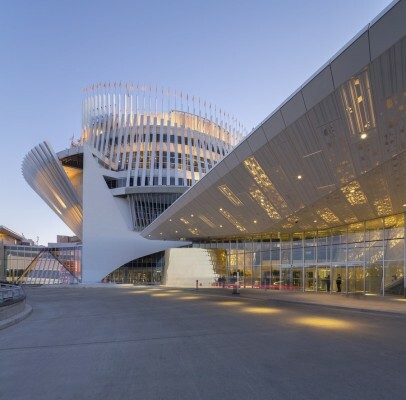 The interior design team at Moureaux Hauspy, part of Provencher_Roy, collaborated on the interior redesign of the whole project, including the entrances, gambling areas, common areas and the VIP zone. 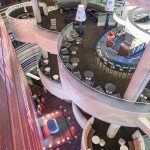 It appointed the firm Blazysgerard to work on redesigning the restaurants on Level 5. Despite the duration and the extent of the works, the operational flexibility of the teams involved in this project will have allowed the Casino to continue its operations without causing major interruptions or inconveniences to the clientele. Moreover, the architects minimised the impact of their intervention on Expo 67’s historical site and respected the identity of the former French pavilion. For example, they used the same original architectural language to redesign the new main entrance. 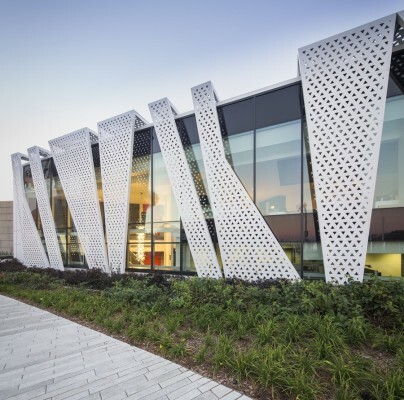 Plus, the new galleries housing the administrative offices were placed in a new landscaping that honours Expo 67’s former basins and watersheds.